Thirteen original acoustic-driven rootsy-folk/retro-jazz/dark-blues/power-pop songs and one torchy vintage cover tune--clever, eclectic and soulful. 2008 Great American Song Contest Finalist/Honors: "Elsie"
2008 Great Lakes Songwriting Competition Honorable Mention: "Elsie," "Indifferent Love." The first song on this fine set lured me in – “Talk To Ya, Mister” boasts Patti Ecker’s sassy, bluesy vocal over a groovy, countrified soul vibe. A whole bunch more of this would be cool, I thought. In the same radio-ready adult-alternative vein as “Mister,” Ecker and her tasty backing players later deliver the mellow, soulful "Shine." But Gypsy Lover’s Eyes is so much more. Ecker’s album also has a full complement of jazzy tracks, some infectious pop rockers, and a few simple acoustic numbers. Ecker’s expressive, conversational vocal style works no matter what the genre, and she has chosen top-notch musicians. Ecker herself is a spot-on rhythm guitarist. On the jazz/standard tunes, Ecker can sound vampy (“Put the Blame On Mame,” the disc’s lone cover), vulnerable (“Baby’s Got the Blues”), gutsy (“Indifferent Love”) and jaunty (“Too Close Too Soon”). “Indifferent” features Ecker’s charmingly dramatic vocal delivering lyrics from a bygone era, punctuated by John Otto’s bouncy clarinet. “Too Close Too Soon” is also a fine vocal performance, this time featuring another gifted soloist, fiddler Rick Veras. The two pop rockers are nifty fun. “Elsie” is a Cajun-style ode to an oft-misbehaved dog. This would go great on a kids’ album, especially since the lyrics are clever without being condescending. “You Missed Her” is breezy, fun, and kind of tropical, buoyed by L.J. Slavin’s dancing flute. The simple, folk-country “The Grace of a Song” and the closing “True Love Whispers” are shimmering, hopeful acoustic gems. At the other end of the spectrum is the absolutely smoking “Learn to Be Lonely.” Ecker wails and growls her useful advice like she’s preaching hard-earned truths, and Steve Doyle nails his slide guitar riffs. CD Review: "Gypsy Lover's Eyes"--written for the Folk and Acoustic Music Exchange by Frank Gutch Jr. Copyright 2009, Peterborough Folk Music Society. 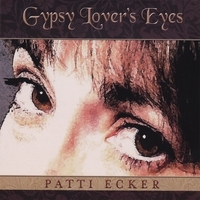 With her new CD,"Gypsy Lover's Eyes", Patti Ecker reveals both song-writing and musical versatility, delivering a solid album of engaging material, ranging from a smoky blues ballad to an up tempo romp with Elsie, her pet dog. Ecker, a staff instructor at the Old Town School of Folk Music, is also an excellent entertainer, able to connect with an audience in a way that makes everyone feel like they've just made a new friend. Take one part Andrews Sisters (all of 'em! ), one part Tom Waits, a generous dollop of Judy and a spicy dash of Lena: Chicagoland's Patti Ecker is a bright, energetic light with a warm soulful voice and a strong, percussive guitar style. When you hear Patti Ecker sing, you can tell she likes to take big bites out of Life – and she wants to share! This is just a great CD. This woman knows how to sing a song. The vocals are delivered confidently and in such a way that I feel like I am sitting in an audience, watching a live performance, even when I’m listening in my van! Patti’s vocal range – both in notes and in emotion – is amazing, and as someone who appreciates a good melody, I am still marveling at these compositions after listening to the CD a dozen or more times. Which brings me to the very best thing about this CD: the songwriting. The songs that Patti has written sound like classics – they are interesting, thoughtful, and very, very well crafted. I know her bio refers to some of the great songstresses of the past, but I think that Patti is one-of-a-kind, and this CD really shows off her considerable singer/songwriter talents. This band is really hot, too. I highly recommend this eclectic, thoughtful and thoroughly enjoyable CD! I\'ve got to pretty much ditto what everyone else has already written here. This is an album of original songs (\"Mame\" being the only cover) that sound as though they could have -- *should* have -- been around forever. Patty\'s vocal delivery is big and bold, sassy and sensual. Her songwriting is stunning. My absolute favorite segue is from the amazingly powerful \"Learn to Be Lonely\" into the gentler, sorrow-tinged \"Not Really Spring.\"
All musicianship on this CD is excellent. These songs desserve to be heard! Smart, emotive, and very musical. The writing, singing and playing are artful and entertaining. I give this recording a gold flatpick & an Oh Yeah! That's my equivalent of 5-stars.